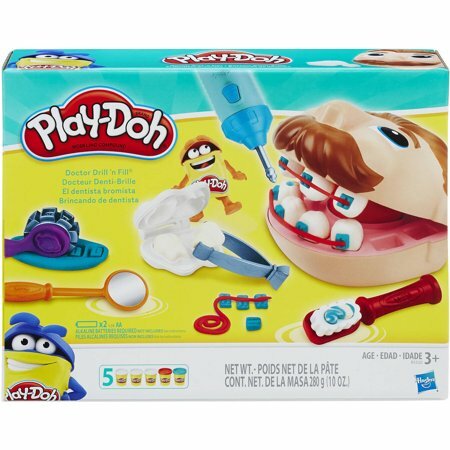 Playing dentist is sure to create smiles with the Play-Doh Doctor Drill 'n Fill Set. Kids can pretend to feel what it's like to be on the other side of the chair by shaping molars with the tooth molds and then checking them with the mirror. Fight cavities by giving them a buzz with the electric drill and then fill them in with more Play-Doh compound. This kids' doctor play set even allows little ones to remove something stuck in-between the teeth with the tweezers. Add some braces with the roller and pretend to keep the patient's pearly whites nice and clean by squeezing some make-believe toothpaste through the toothbrush. This Play-Doh doctor set nurtures a child's creative imagination while providing hours of interactive fun. Little ones can feel engaged by themselves or share the experience with a friend. This Play-Doh Doctor Drill 'n Fill Set makes a thoughtful gift. Celebrate 60 years of creativity with a Play-Doh classic, Squeeze silly toothpaste through the toothbrush, Play dentist by filling cavities, making braces, and more, Still features the electric drill with fun buzzing action, Includes head, drill, tweezers, roller, toothbrush, tooth mold, accessory, instructions, and 5 cans of Play-Doh Brand Modeling Compound. MY 2 yr old girl is obsessed with this, she loves the toothbrush and the drill! its so cute and is def getting her ready for her first dentist visit! Brushing my 3yo's teeth is often a battle, however, she loves watching the YouTube videos with this set in it. So I got it for her, and made her a deal, that she gets this toy, if she agrees to let me brush her teeth without a battle. It has worked a little bit. But mostly, she loves playing with the drill, she loves molding teeth, she loves when the teeth are different colours. My 5 year old loves this. She saw it in a YouTube video and had to have it! My son found this toy fun to play with. He left to go to another toy then came back to this one. Definitely on our Christmas list! I bought this for the children in my daycare and they love it! They have spent hours playing dentist. The moulds and dentist tools are excellent and the children love the battery operated drill! The only negatively thing I have to say is about the hinge holding the top and bottom of the head together, it is quite flimsy and keeps getting stuck every time one of the kids opens or closes the mouth. The kids of course try to force it once it gets stuck, and I know it will not be very long before it gets broken! But having said that it will still be able to be played with and the kids will still have a ton of fun with it. I would buy it as a gift, and do intend to buy a second one for my daycare. My 5 year old was very please with this toy, the only thing that was difficult for her was the actual making of the teeth, also when all the teeth are in the mouth is unable to close. we didn't even get a day out of this. This hinge on the "head" did not clip on properly, so when forced to close the plastic snapped and broke. so sad.